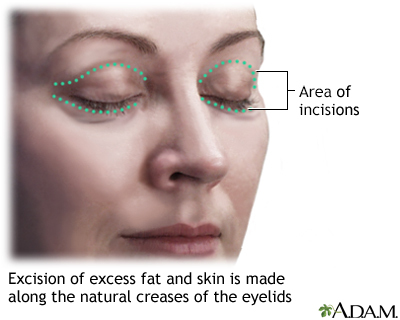 Eyelid lift surgery is done to repair sagging or drooping upper eyelids (ptosis) and remove excess skin from the eyelids. 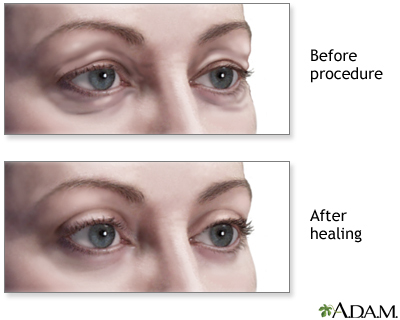 The surgery is called blepharoplasty. Eyelid surgery is done in a surgeon's office. Or, it is done as outpatient surgery in a medical center. The surgeon injects numbing medicine (anesthesia) around the eye so you do not feel pain during the surgery. You will be awake while the surgery is done. Before you leave, the health care provider will cover your eyes and eyelids with ointment and a bandage. Your eyelids may feel tight and sore as the numbing medicine wears off. The discomfort is easily controlled with pain medicine. Keep your head raised as much as possible for several days. Place cold packs over the area to reduce swelling and bruising. Wrap the cold pack in a towel before applying. This helps prevent cold injury to the eyes and skin. Your doctor may recommend an antibiotic or lubricating eye drops to reduce burning or itching. Your doctor will remove the stitches 2 to 7 days after surgery. You will have some bruising, which may last 2 to 4 weeks. You may notice increased tears, more sensitivity to light and wind, and blurring or double vision for the first few weeks. Scars may remain slightly pink for 6 months or more after surgery. They will fade to a thin, nearly invisible white line. The more alert and youthful look usually lasts for years. These results are permanent for many people. Bowling B. Eyelids. In: Bowling B, ed. Kanski's Clinical Ophthalmology. 8th ed. Philadelphia, PA: Elsevier; 2016:chap 1. Drolet BC, Sullivan PK. 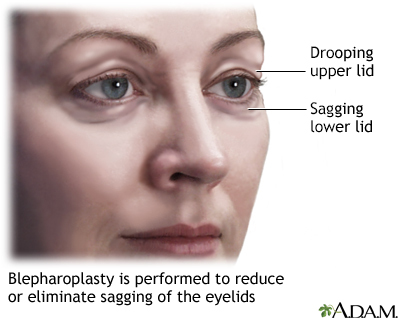 Evidence-based medicine: Blepharoplasty. Plast Reconstr Surg. 2014;133(5):1195-1205. PMID: 24776550 www.ncbi.nlm.nih.gov/pubmed/24776550.